Send your thanks to the boy band gods -- *NSYNC is reuniting this year! ET's Katie Krause caught up with Lance Bass at his home in Los Angeles on Wednesday, where he opened up about the band's big 20-year anniversary, and revealed a special music release for fans. WATCH: *NSYNC Reunites for JC Chasez's 40th Birthday, Look Dreamier Than Ever! "We're doing something [special].I don't know if I can announce it yet," Bass teased, before spilling on *NSYNC's big projects. "We're coming out with a really cool vinyl edition of our Christmas album because it's coming up on the 20 years of that [1998 Home for Christmas] album," he shared. "And then we're going to be getting our star on the [Hollywood] Walk of Fame this year at some point." "We'll all be there!" confirmed Bass, who is currently competing on Fox's My Kitchen Rules. "We just have to decide on a date. We're terrible at planning things." "We're five guys, so for us to make a decision about anything is really hard, so we just need to do it. So hopefully maybe around Christmas time," he said. "It'll be fun to see everybody again." The boys pose up high in London, matching in blues and greens. Our eyes! Back in the late '90s, we thought we were blinded by their cuteness, but turns out it might've been those shiny jackets. Baby-faced Brit poses with the boys, and we love it! Look at those sultry stares! Did they realize they were staring straight into our souls? Sometimes things got a little weird (sweet cornrows, JT). Not ashamed to say we got one of those marionettes for Christmas. As if we needed another reason to love them! Add puppies to the mix and the fact that they care about animals, and we're beyond in love. And that one time Joey played with a tiger cub? Chris knew Kris Jenner back when Getty only referred to her as Kathy Lee Gifford's "friend." Welp, it was the Grammys. But guys... seriously? There's JT, getting all sultry on us. This one time, JC wore a two-tone snakeskin jacket. It's okay though, we still loved him. And Lance clearly had a great time channeling his inner 5 year-old at the Challenge for Children charity event they group held. Hello, glamour shot! Loving the denim theme (background/floor included). Time to sit for a slow song... a.k.a. melt every girl's heart. Cue the creepiness: here they stand with their wax figures at Madame Tussaud's in New York. We must say JC and Lance's figures are right on. Cleaning up in all black, the guys look pretty great. Except, JC PLEASE cut your hair! Phew, that's better! They're a little squinty, but they look casual-cool. 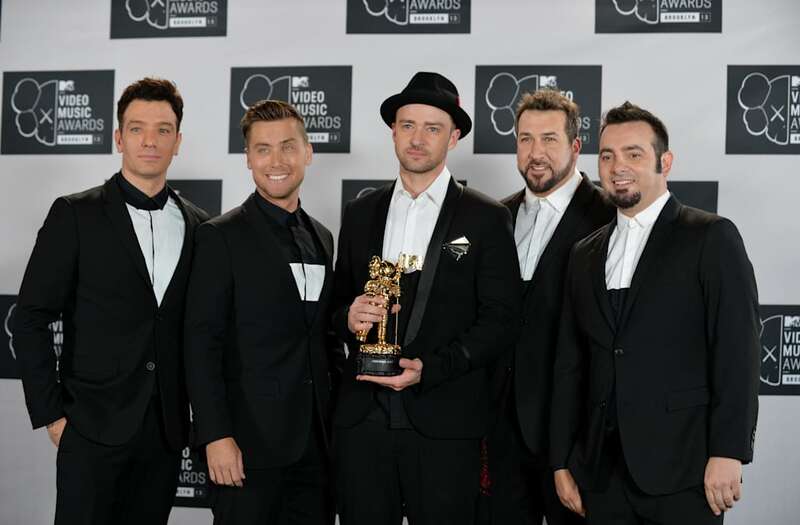 Though *NSYNC reunions have been few and far between since the group announced their "hiatus" in 2002, Bass says he and the guys -- Justin Timberlake, Chris Kirkpatrick, Joey Fatone and JC Chasez -- couldn't be closer. "We talk daily," he revealed, "all five of us." Surprisingly, it's not Timberlake's hair that gets the most teasing. "Joey gets a lot of the brunt of our jokes," Bass confessed. "I mean, those guys are my brothers and so we act like immature brothers all the time." As for the one thing they haven't talked about? That would be Lifetime's upcoming Britney Spears biopic, Britney Ever After, which touches on her relationship with Timberlake. "I need to bring that up. I'll tell you what they say," Bass promised. My Kitchen Rules airs Thursdays at 9 p.m. ET/PT on Fox.